Your Entire Family Will Love! Florida offers beautiful beaches, brilliant blue skies, day after day of gorgeous hot weather and, of course, Disneyworld! Properly planned, a visit to this part of the world will fill you with energy and bring your family closer together than you ever dreamed possible. Welcome to Sunkissed Orlando Holidays. 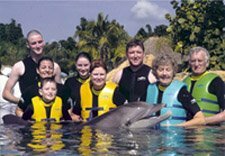 We're the Philp family, your guides to wonderful Orlando getaways your entire family will love. The Florida sun first kissed our family fifteen years ago. We've been hooked on the Sunshine State ever since! That's us to your right - before the suntans. As you can see, your whole family can take part in some pretty marvelous activities. At home in the UK, friends (and even strangers who've heard about our Orlando website) are always asking us for travel advice. Between the 8 members of our family, someone is asked how to plan a successful holiday at least once a day! How to get the best deals on flights, accommodation, car rentals and travel insurance. Basically, you'll find loads of useful information right here to view and share with your family. So check out the navigation bar on your left or click on the links above. And remember, we update this site often, adding new stories, views and experiences. Please bookmark us and come back often! When you're planning your Orlando holidays, you don't want to use old news and information. We will keep updating our site via our RSS feed. Simply click onto the RSS feed below our navbar, and follow the instructions. It's an easy way to stay on top of what's happening in Central Florida,free of charge.